This PDF 1.3 document has been generated by PScript5.dll Version 5.2.2 / Acrobat Distiller 5.0 (Windows), and has been sent on pdf-archive.com on 28/03/2016 at 10:43, from IP address 182.52.x.x. The current document download page has been viewed 358 times. File size: 1 MB (7 pages). traditional motor test methods and describe production applications wherein the method has been automated. several points along the torque / speed curve of DC permanent magnet and universal motors are typically of interest depending upon the application. instruments in a production environment and / or the usefulness of the test results beyond a mere pass or fail indication. from locked-rotor to full load in about 4 seconds. direct current automotive type starter motor. Figure 1: Typical Induction Motor Torque / Speed Curve. speed and / or direction of rotation. hour or per shift or per batch. 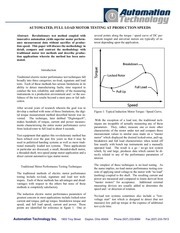 motors that pass or fail signature performance testing. and measure the resulting speed, current and power. to computer controlled, fully automated systems. say full load or pull-up, will be measured. proven to be somewhat fragile for the typical manufacturing environment. shaft, additional calibration and maintenance and potentially higher equipment costs all contribute to the complexity. The longer test time also is a consideration. speed over a fixed period. method utilizes it to calculate torque. known inertial and a high-resolution rotary digital encoder mounted on that shaft. A simplified fixture drawing is shown in figure 2.
required to calculate torque is the change in speed. 0.07 RPM to be measured in the 16.67 ms period. Figure 2: Simplified Digitorque® Fixture. speed curve of the motor from locked-rotor to full load. governor switch speed are examples of such information. Figure 3: I Typical Digitorque® Graph of a PSC Motor. Figure 3: II Extreme Example of Torque Ripple – Caused by a Rotor Hit. Figure 3: III Example Digitorque® Graph of a Governor Switched Motor. may be found in Figure 3:II. and encoder was lowered from above. See figure 4.
speed is an obvious feature on the Digitorque® graph. which may then be compared to limits for test acceptance. switched motor may be found in Figure 3:III. measurement may then be compared to limits for test acceptance or the entire torque / speed graph may be adjusted to compensate for the friction torque. effectively in fully automated test systems. Figure 4: Coupling to motor from above using a collet. The next example is an automotive-type DC starter motor. fixture assembly consisting of a mating gear, shaft, flywheel and encoder was raised into position from below. well as tested the motor under load. See figure 5.
threaded shaft. In this application, a small portion of nonthreaded shaft was available for clamping to via a collet. assembly off the coupling adapter. See figure 6.
a gear that mates with that of the starter motor’s drive. which matched the clutch bearing shaft specifications. testing even in a fully automated test station. doubt, be a higher quality product and happier customers. to insure the motor and test fixture shafts do not turn independently in automated coupling application. proof of design conformance for every single motor delivered. Digitorque® is certainly a tool for the future. This file has been shared by a user of PDF Archive. Document ID: 00353833.